good interview with Marisa the “high priestess of [Google’s] simplicity” here. Erin and I went to Barnes and Noble tonight and spent some quality time in the reading chairs there. I picked up a copy of Make magazine. If only it weren’t $35/year for 4 issues I’d have a lifetime subscription. On page 2 of the magazine was the Maker’s Manifesto by Ulla Maaria. I’m reposting it here, but you can see the original on her website. The Manifesto is a great set of philosophies for anyone who likes to tinker with the world around them. I’m sure some of my friends will really appreciate it. I want to live my life with this as (one of the) central ideas. The great obstacle to discovering the shape of the earth, the continents, and the oceans was not ignorance but the illusion of knowledge. 92% of all the scientists who have ever lived are alive today. 85% of all the engineers who have ever lived are alive today. Man, I’ve gotta get me an iPod. Learnoutloud has literally thousands (9000) podcasts on just about any topic you can imagine. Speaking of cools podcasts, here’s one with Jim Rygiel, the special FX supervisor on the Lord of the Rings movies. Good stuff. *UPDATE* Holy Cow! Lots of these podcasts are videocasts. I don’t know if you can get them onto a video iPod, but how cool would that be? Having dozens of 30 minute cool stories on your person for those downtimes. Wow. I think in the future music majors will compose theme and variations on this tune as their senior thesis, and silent audiences in black tie will listen respectfully. Takes a while to load (on a high speed connection), but it’s worth it. I went back to Fine Lumber today and got one more piece of QS red oak for the top. It’s a very nice ray-flecked piece. I planed it down to 3/4, jointed the edges, and it’s gluing up right now. Big heavy thing. So now I’ve almost got all of the pieces formed and I’m almost ready to sand (again- yuk). Once that’s done I’ll cut the final joinery and assemble. Worked 3.5 hours today. Total of 19 hours. Okay, Sean, here’s the answer to your question. So get that sucker up to almost 11mph and you’ll feel a lateral force of gravity equal to 1g. Of course, this formula doesn’t take into account the natural 1G that you feel from the earth. This is going to deflect the perceived lateral acceleration to a 45 degree angle. To get a pure 1G lateral acceleration in the presence of the natural 1G of the earth’s field you’re going to….. have to ask somebody else. That math is beyond me. Yeah, if you’re getting tired of my woodworking posts, tough. Skip ’em. 🙂 I’m writing them here as a reference for my post later on the woodworking site I frequent. Spent 2.5 hours tonight (total so far is 15.5) finally gluing up the sides! Yes, it takes two and a half hours to glue up the sides because I was scared to death that I’d do it wrong. They’re done and look great. I’d have been at it sooner but Erin and I spent a couple hours hanging a new light above our dining room table. Oy. That old golden atrocity is so outta here. Now we have a nice 5 shade antique light. The only problem is that dimming it to 50% with the X10 switch causes the main kitchen florescent to turn on. Stupid Switchlincs. Got another 3 hours in on the bookcase today. Total time is around 13 hours so far and I’ve almost finished the sides. The bookmatched solid quartersawn (QS) oak floating panels are very nice and the sides are surprisingly solid. It’s beginning to look like real fine furniture! I planed the floating panels down to proper thickness today, checking them constantly with my calipers to make sure I didn’t take off too much. I made a slight mistake with the alignment of the tenons so I have to address that in the next step. Nothing too bad. Then the sides get assembled. I also decided tonight that I am going to add another level of complexity and incorporate half-lap dovetails in the face-frame. I’ve never done them before and they involve cutting into my beautiful side panels- and being VERY exacting when I do it. They don’t look too difficult to achieve, though you’ll hear from me if I mess them up. Tomorrow: sanding. Yuk. Then it’s on to the plywood cutting. 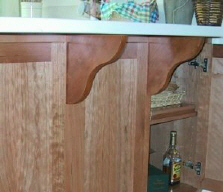 I’m still thiiiis close to using QS oak for the shelves. The rest of the wood is so nice that the idea of using mere plainsawn plywood offends me. I’d still use ply for the back, but I’ve got a piece with knock-your-eyes-out grain, so that’s okay. Oh yeah, I also decided to add some elongated corbels, and Erin picked out a nice 2x2x10″ piece of ebony today for the details. Popcast: It’s like Daypop for podcasts. PithHelmet. Automatically removes ads from web pages. Fast, fairly stable (so far), and does a number on your cookies, too. Something else to be thankful for. I know that there is a boatload of disagreement and angst about the US being in Iraq/Afghanistan. I’m not talking about that. I’m thankful that there are several million people who used to live in fear of a brutal dictator, who now do not. It’s not a perfect world out there, but being able to stand together and have a corporate say on who will run your life is a step in the right direction, and anyone who would infer that the Iraqi’s were somehow better off before is a crazy person. Could you say that to her face? Pimpmysafari, for all your Safari pimping needs. Japan’s Hayabusa space probe is reportedly down safe on asteroid Itokawa. Check out this cool picture. Engadget is reporting the new Xboxes are “crashing like mad“. Jake Cress and his famous “Oops” chair. Check out some of his other work here. Nice interview here.